Last year, over 7.4 million Americans moved for job-related reasons, according to the U.S. Census Bureau. Moving for your job makes perfect sense, when you consider that 76 percent of companies with more than 100 employees across multiple geographic locations use geographic pay differentials and 86 percent of companies with over 10,000 employees do the same. What does that mean? In short, it means that it pays to think about where you want to live … literally. Consider, for example, how software engineer salaries vary from city to city across the country. Take a look at the 10 highest paying U.S. cities for software engineers, as compiled by Paysa. Based on 21K profiles, the average salary for a software engineer in San Francisco, CA is $217,000 per year. As far as education goes, 75 percent need a bachelor’s degree and 72 percent need to be proficient with Java. Top San Francisco companies for software engineers are: Google, Cisco, Facebook, Apple, and Twitter. Based on 45K profiles, the average salary for software engineers in San Jose, CA is $216,000 per year. Educationally, 73 percent of software engineers have a bachelor’s degree and 73 percent are required to know Java. Top San Jose companies employing software engineers are: Google, Cisco, Facebook, LinkedIn, and Apple. Based on 17K profiles, the average salary for a software engineer in Seattle, WA is $189,000 per year. As far as educational requirements go, 76 percent of software engineers in Seattle need a bachelor’s degree, and 60 percent of all software engineers there are proficient in Java. Top tech companies in Seattle for software engineers are: Microsoft, Google, Amazon, Facebook, and Tableau. Based on 11K profiles, the average salary for a software engineer in Los Angeles, CA is $183,000 per year. 75 percent of software engineers in Los Angeles need a bachelor’s degree and 57 percent need to know Java. Top companies hiring software engineers are: Google, Symantec, Northrop Grumman, Snapchat, and DIRECTV. Based on 618 profiles, the average salary for a software engineer in Santa Maria, CA is $174,000 per year. 76 percent of software engineers in Santa Maria need a bachelor’s degree and 51 percent must be proficient in C#. Based on 433 profiles, the average salary for a software engineer in Santa Rosa, CA is $172,000 per year. Educationally, 74 percent need a bachelor’s degree and 53 percent must know Java. Based on 285 profiles, the average salary for software engineers in San Luis Obispo, CA is $161,000 per year. As far as education goes, 78 percent of software engineers in San Luis Obispo have bachelor’s degrees and 68 percent must be proficient in Java. Based on 2K profiles, the average salary for a software engineer in Sacramento, CA is $157,000 per year. Educationally, 71 percent need a bachelor’s degree and 55 percent need to know Java. Top tech companies are: Intel, IBM, Hewlett-Packard, and Infosys. Based on 23K profiles, the average salary for a software engineer in New York, NY is $152,000 per year. A full 72 percent of software engineers in New York need bachelor’s degrees and 57 percent need to know Java. Top companies for tech talent are: Google, IBM, FactSet Research Systems, Bloomberg, and Facebook. Based on 20K profiles, the average salary for software engineers in Boston, MA is $144,000 per year. Educationally, 72 percent software engineers in Boston need a bachelor’s degree and 69 percent need to be proficient in Software Development. Across the top ten cities, Google, Facebook, Cisco Systems, and Microsoft accounted for the largest number of software engineers employed. 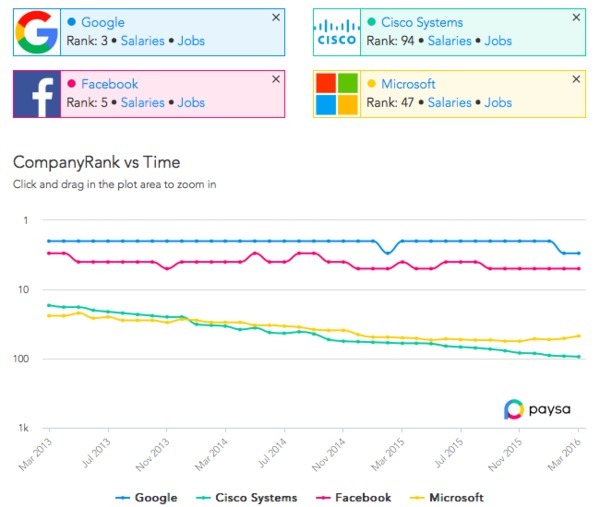 Below is a look at how these companies rank on Paysa’s special company ranking system for tech talent. Paysa CompanyRank over a three year period. Paysa is dedicated to providing the most comprehensive salary information available for top tech talent. With the tools provided by Paysa, you can find out what your skills are worth in the current tech market, and you can negotiate a job offer or raise with confidence. Better yet, Paysa can be personalized just for you. Sign up here to personalize Paysa and get recommendations regarding skills and jobs designed just for you.